The AH-64 Apache Attack Helicopter is the champion of battlefield helicopters. When a battle is unfolding, it is important to hit hard and disrupt the enemy's forces. 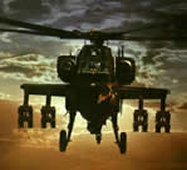 The helicopter is the knight in shining armor to ground troops who need the flexibility and striking power of their own aircraft overhead, and the AH-64 Apache is the champion of battlefield helicopters. Apache history was made 25 years ago when the first prototype--known as the YAH-64--lifted off on September 30, 1975, from test facilities in Carlsbad, California. The twin-engine, T-tailed attack helicopter was developed for the U.S. Army by Hughes Helicopters, today a part of the Boeing Company. The torch was passed from the YAH-64 to the AH-64A Apache to today's AH-64D Apache Longbow. The T-tail is gone and the aircraft's fully integrated avionics and weapons system have given today's Apache Longbow a digital capability that would have been hard to imagine in 1975. 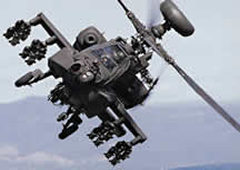 The Apache uses electronic wizardry to find its way and to aim its high-tech missiles and cannon. The two pilots of the slender, mantis-like Apache can hug the earth when they need to or use night-vision equipment and high-tech sensors to navigate through smoke and rough weather to seek out enemy troops and tanks. 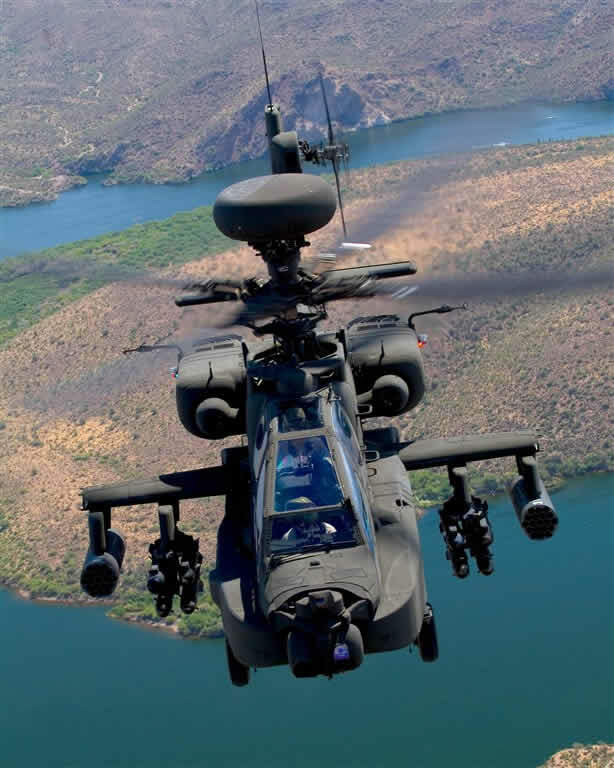 Assisted by observation helicopters and staying in close contact with troops on the ground, the Apache can shoot with remarkable accuracy from a greater distance than most other combat helicopters. With its speed, durability and accuracy, the Apache adds a new dimension to the ground commander's responsibility of outsmarting and outfighting his adversary. There are three variants the Apache: the original AH-64A, the next-generation AH-64D, and the radar-equipped AH-64D called the AH-64 Apache Longbow. The Apache Longbow is the newest Apache version. The Longbow version is 28 times more effective than the original. 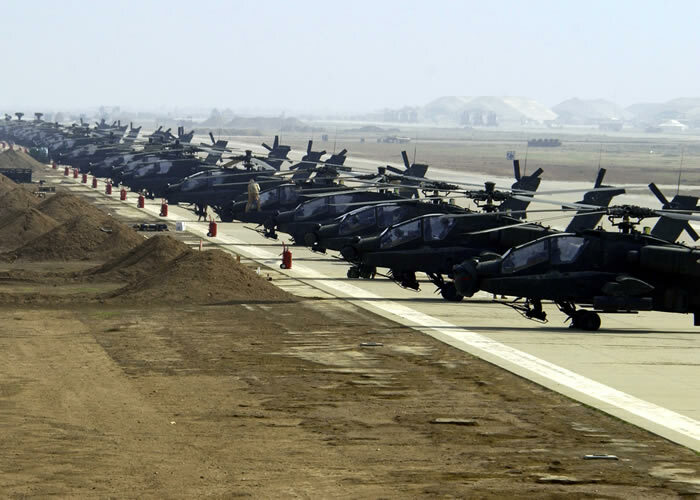 More than 1,100 Apaches have been delivered to customers around the world since it went into production in the 1980s. Boeing has announced a commitment to deliver 1000 more in the next decade. The Apache has accumulated more than 1.5 million flight hours since the first prototype flew in 1975. The first fully equipped U.S. army unit with Apache Longbows, fielded in November 1998, was the first unit to field the Interactive Electronic Technical Manual. A revolutionary Class IV computerized data storage system enables troubleshooting, configuration management, and eliminates the need for paper technical manuals. Planned enhancements for the Apache Longbow include a Modernized Target Acquisition Designation Sight/ Pilot Night Vision Sensor, enhancements to the Data Modem, advanced non-line-of-site communications, and a full digital map. The Longbows have greater weapons accuracy at longer range and have the ability to fight more effectively at night and in nearly all weather conditions. 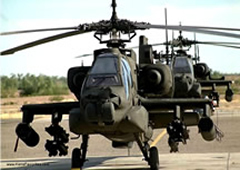 The US army has established programs designed to keep its Apaches at the leading edge of technology for the next 30-plus years. The Apache is an extremely maneuverable chopper. It can perform loops, rolls, hammerhead stalls, and split-S maneuvers at full mission weight. There are many improvements from the original AH-64A to the AH-64D Longbow. The AH-64D Longbow is 400% more lethal than the original and 720% more survivable. It has the ability to initiate the radar scan, detect and classify more than 128 targets, prioritize the 16 most dangerous targets, transmit the information to other aircraft, and initiate the precision fire and forget attack - all in less than a minute. In addition, it also requires one-third less maintenance man-hours per flight hour than the requirement. The first Allied shots at Iraqi ground troops during the Gulf War were fired by AH-64A Apaches. They destroyed air defense systems to create a corridor for the Allied air attack. During Operation Desert Storm, AH-64As were credited with destroying more than 500 tanks plus hundreds of additional armored personnel carriers, trucks, and other vehicles. 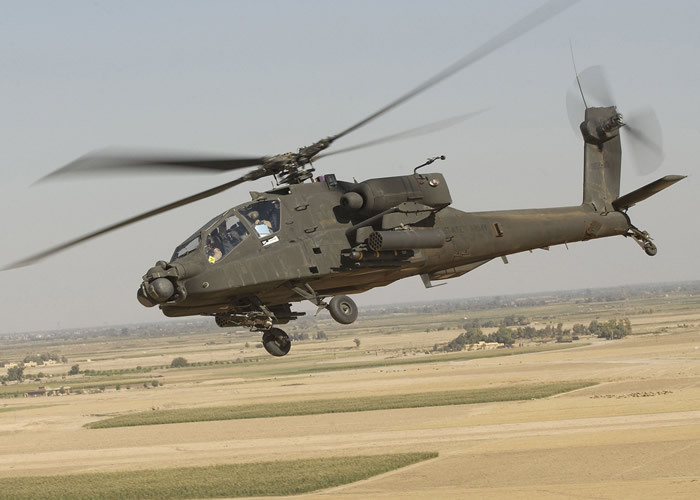 Boeing delivered the U.S. Army's 100th Apache Longbow in December of 1999. Below are explanations and information for different aspects of the Apache Helicopter. The Longbow has very sophisticated sensors to detect ground forces, buildings, and aircraft. Using the radar dome mounted to the mast the Apache sends out millimeter radio waves that can make out the shape of anything in range. The radar signal processor compares these shapes to a database with trucks, people, and several aircraft to identify the general class of each potential target. The computer pinpoints these targets and displays them on the pilots and gunners panels. Both the pilot and gunner have night vision systems. The pilot's night vision sensor is mounted on top of the Apache's nose. The gunner's is located on the lower turret that also includes a normal video camera and a telescope. The information from these turrets is displayed on a small display in each crew-member's helmet. Infrared sensors in the cockpit tracks the movements of the crew's heads, when the pilot or gunner moves their head the sensors follow. There are also manual controls to move the sensors. The pilot sits behind the gunner in the cockpit. Each seat position has redundant systems allowing the gunner to fly the aircraft if necessary or allowing the pilot to fire the weapons. The Apache has a digital stabilization system that fine-tunes the angles and pitch of the rotors for a smooth flight. It can also make the helicopter hover automatically for short periods. Three digital display panels provide the crew with most navigation and flight information. The apache has two wings each with two pylons. These pylons can carry any combination of fuel tanks, Hellfire missiles, or Hydra rocket launchers. Each rocket launcher can carry 19 folding-fin 2.75-inch aerial rockets, secured in launching tubes. One rocket can be fired at a time or they can be fired in groups. The rockets can be armed with various warheads. For example, they might be armed with high-power explosives, smoke producing materials, or sub-munitions (small bombs that separate from the rocket in the air and fall on targets below). The lightweight (only weights 127 lbs) M230 30-mm automatic cannon is attached under the helicopter's nose. It too can be controlled from the gunner's helmets. The automatic cannon is a chain gun design which differs from a machine gun in that an electric motor rotates a chain, which slides the bolt to load, fire, extract and eject the cartridges. A machine gun uses the force of the cartridge explosion or flying bullets to move the bolt. The cartridges travel from a magazine above the gun to a feed chute down to the chamber. It can hold a maximum of 1,200 rounds and can fire up to 650 rounds per minute. It fires high-explosive rounds designed to pierce light armor. The Apache's primary weapon is the Hellfire missile. Each missile is like a miniature aircraft, complete with its own guidance computer, steering control, and propulsion system. The warhead is highly explosive and powerful enough to burn through the heaviest tank armor in existence. Four missiles can be attached to each pylon; an Apache can carry up to sixteen missiles each time. Before the launch, each missile receives instruction from the Apache computer. The original used a laser guidance system. The Apache gunner aims a high-intensity laser at the target. When the missile is launched, it searches for this laser and follows it to the target. This system has some drawbacks; weather conditions can affect the laser beam's effectiveness. The missile can lose site of the target and never reach it and the helicopter has to stay fixed on the target in order for the missile to reach it, thus leaving the apache vulnerable to attack. The Hellfire II, used in Apache Longbow helicopters circumvents these deficiencies. The helicopter's radar locates the target, and the missiles zero in on it. Since radio waves are not obscured by clouds or obstacles, then the missile is more likely to find its target. In addition, since it does not have to keep the laser focused on the target, the helicopter can fire the missile and immediately find cover. The first line of defense the Apache helicopter has is keeping out of range. It is specifically designed at flying low to the ground and hiding behind cover. The Apache also has a radar jammer to confuse the enemy's radar. To hide itself form heat-seeking missiles it reduces its infrared signature. The Black Hold infrared suppression system dissipates the heat of the engine exhaust by missing it with air flowing around the helicopter. The cooled exhaust then passes through a special filter, which absorbs more heat. 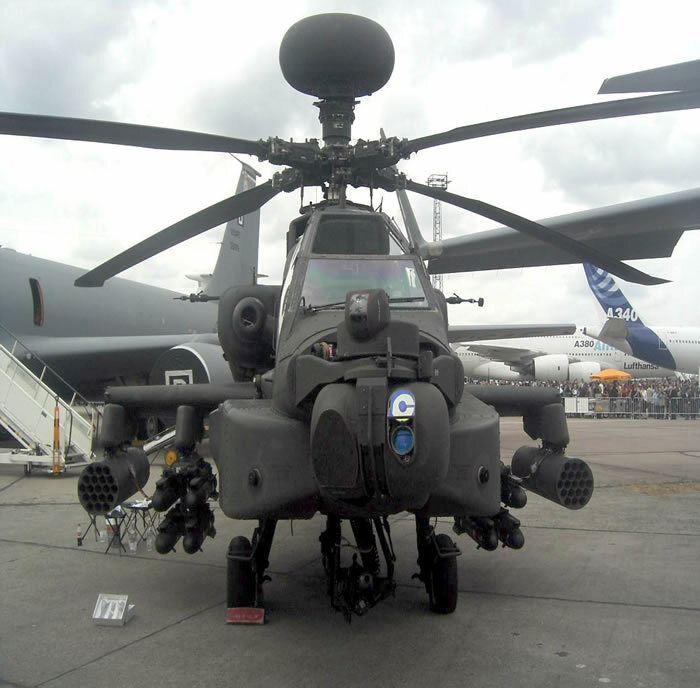 The Apache Longbow is also equipped with an infrared jammer, which generates infrared energy of varying frequencies to confuse heat-seeking missiles. The Apache is heavily armored on all sides. Some areas are also surrounded by Kevlar. The cockpit is surrounded by bulletproof glass. According to Boeing, every section of the Helicopter can survive 12.7-mm rounds and vital engine and rotor components can withstand 23-mm fire. The cockpit uses crumple zones, like in a car to protect the crew if there is a crash.